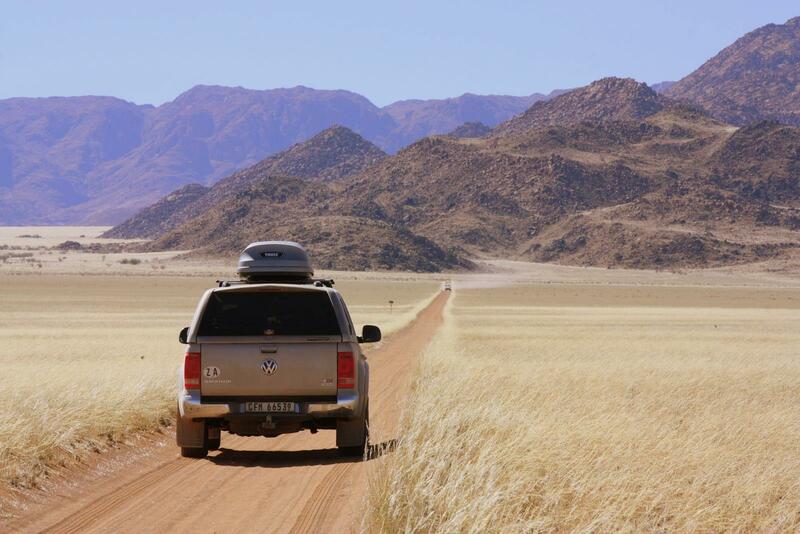 Seasoned travellers describe Namibia as ‘Africa Lite’ because it is an easy country to tour; the road network and infrastructure are good and the people friendly and efficient. Combine this with the unique beauty of the stark landscape and you have the ideal holiday destination. An added bonus is that most of Namibia is malaria free. 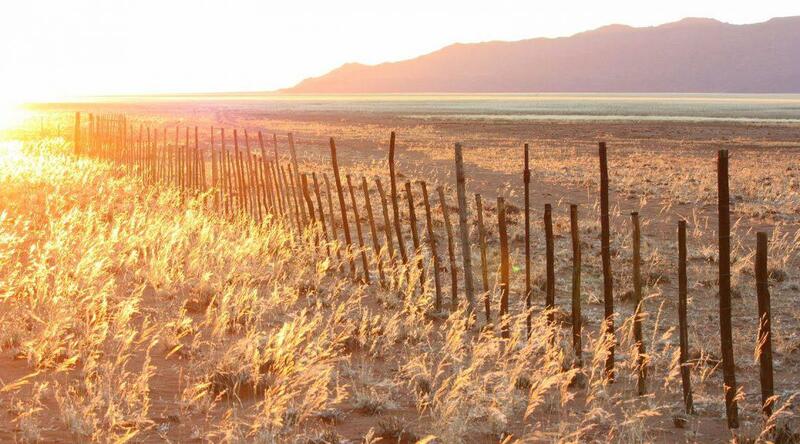 The best time to visit southern Namibia is between April and October which are the cooler months and outside the rainy season when flash floods can occur. If you visit in April/May you will be intrigued by prolific growth in the veld shortly after the rainy season. There is little as soul soothing as the long, waving grass and the spectacular colour changes in the surrounding mountains in the late afternoon. Soft long grass swaying in the afternoon breeze. 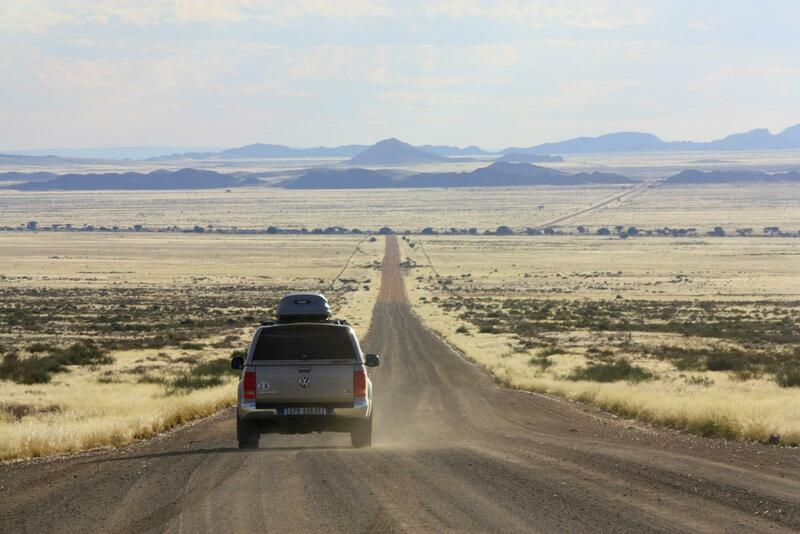 If you have only two weeks available and you don’t want a rushed holiday, you can enter Namibia from South Africa through the Noordoewer border post near Springbok, which is very efficient, explore the back roads of southern Namibia and exit at the Ariamsvlei border near Upington. This pleasurable route will take you over about 1 500km of excellent dirt and tar road and you will get a good taste of what Namibia offers. 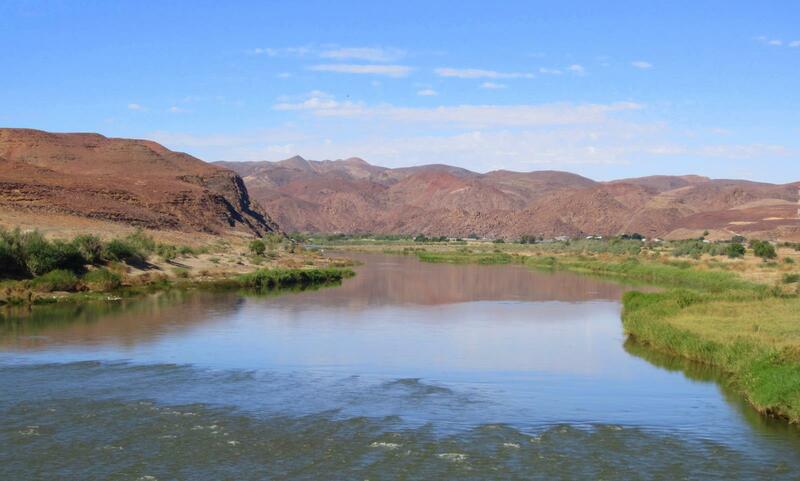 There are a number of camps on the river at Noordoewer where you can experience river rafting, camp or lodge and enjoy the ambiance of this mighty river which forms the border between Namibia and South Africa. The Gariep River forms the border between South Africa and Namibia. From Noordoewer, on the way to the Ai-Ais National Park, you will pass Aussenkehr on the northern banks of the Gariep River. This gigantic farm produces tons of export grapes annually and during the harvesting season close to 20 000 seasonal workers live in their quaint little reed houses. While you are there, visit the Aussenkehr Nature Reserve and drive the Quiver Tree Forest 4WD Trail. You have to get a permit for this at the Norotshama River Resort where you can camp or stay in self-catering chalets. 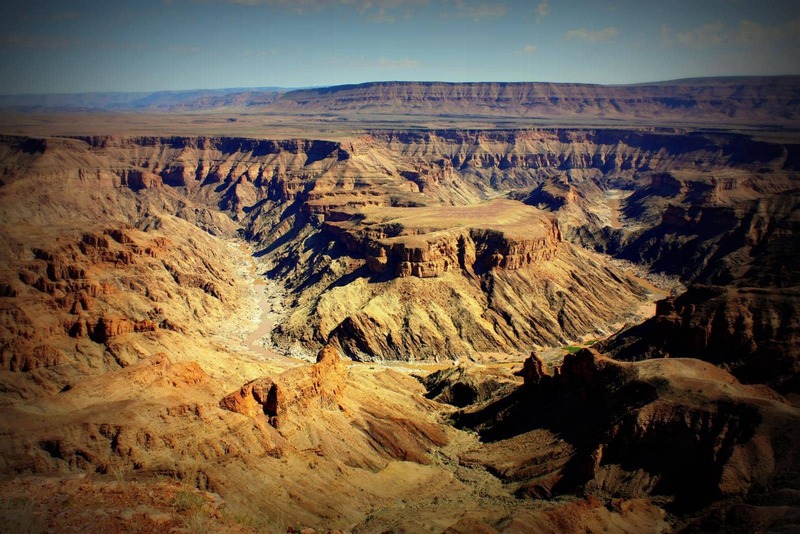 The majestic Fish River Canyon is one of the most spectacular sights in Africa. Its formation started about 350 million years ago but the river itself now runs in a bed 1,5 million years old. A geologist’s paradise, its walls display a clear record of much of the geological history of the region. It is unimaginable that today’s canyon once used to be the huge Namaqualand Mountains which were eroded to a vast plain, then became the Nama Sea when continental drift caused an ocean trough. It took millions of years to completely fill the Nama Sea with sediment which was transformed into hard metamorphic rock by heat and pressure. Only much later did erosion start playing its part in creating the canyon. The more adventurous with more time can do the five day Fish River Canyon hike. The majestic Fish River Canyon. You can hang out at the Ai-Ais Hot Springs Resort for a few days and enjoy the soothing warm water of the spring, do some day hikes or just enjoy the natural beauty of the Ai-Ais National Park. The resort offers camping as well as lodging and has facilities like the spa, outdoor swimming pools, a shop, restaurant and fuel station. 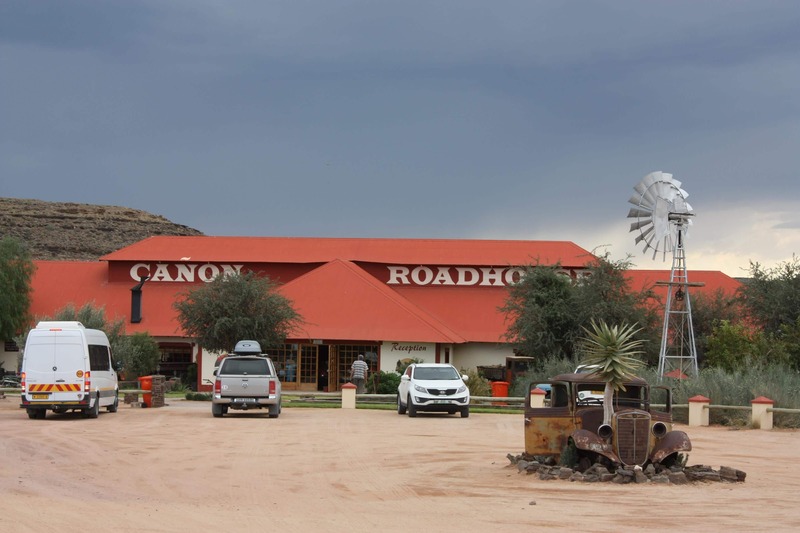 On the way to Seeheim you have to stop at the Canon Roadhouse to enjoy an ice cold drink and marvel at the antique automobiles from yesteryear. Seeheim will take you further down memory lane. Today it consists of a solitary hotel on a barren hill, a furniture factory at the back of the hotel, one house, a taxidermist and a lonely railway line. 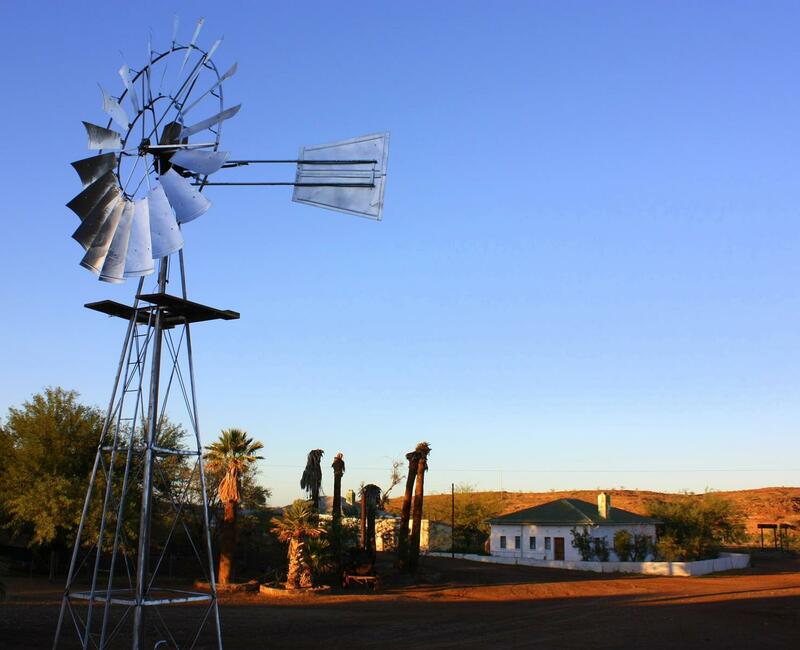 In its high days, during the first two decades of the 1900’s, Seeheim was bigger than Keetmanshoop! Around 1903 Seeheim was an important train junction for all trains travelling to and from South Africa and it was compulsory for all passengers travelling between these two countries to stay over at Seeheim. In those days there were three hotels, a post office, a railway maintenance yard and a few houses. The Seeheim train station played an important role in the agricultural industry as all farmers of the district had their equipment delivered to the station and their produce was transported to various markets by trains arriving from the south, north and west from the coast. 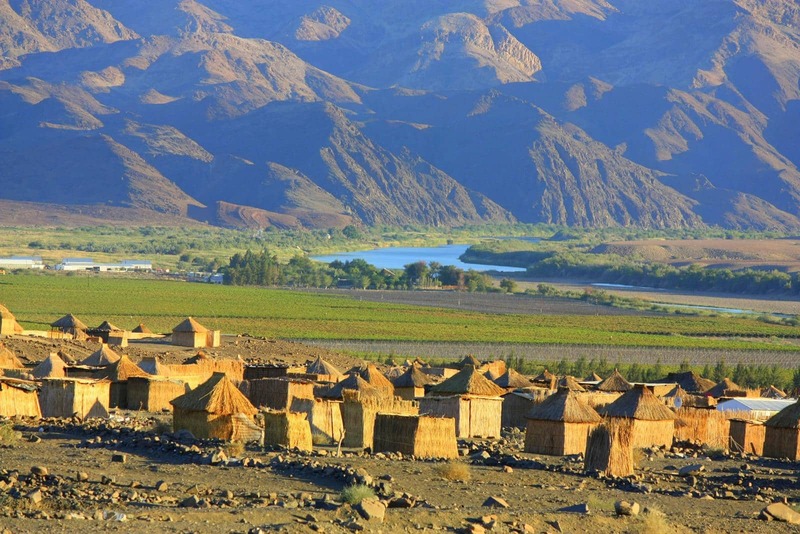 At that stage the Fish River which flows close-by had permanent water holes which enabled farmers to produce vegetables and tobacco on the fertile agricultural ground on the river banks. During the First World War the trains on this line carried loads of troops and later, after the first diamond was found in 1908 near Kolmanskop the town became even more of a hub. As expected the town boomed, and even boasted a brothel! The Seeheim railway was an economic life line in this remote area as it also transported firewood, water and later charcoal. There was a big flood in 1922 when 550 mm of rain flooded down in two days. The Riverside Hotel was washed away and many residents had to move to Keetmanshoop. The current bridge over the river was built in 1974 when the road between Keetmanshoop and Lüderitz was tarred. The road no longer ran through Seeheim and as a result it became a ghost town. Even the Seeheim Hotel closed and stood empty for 24 years, before it was restored and re-opened in 1998. The hotel was renovated and upgraded, now having 28 bedrooms, a swimming pool, a lovely lapa area and camping facilities. Seeheim will take you down memory lane. If you are interested in history, you should stop by at Aus and visit the graves, prisoners’ camp and fortifications from World War I. You can also do the 9km Schutztruppe hiking trail which will take you about 3 hours. 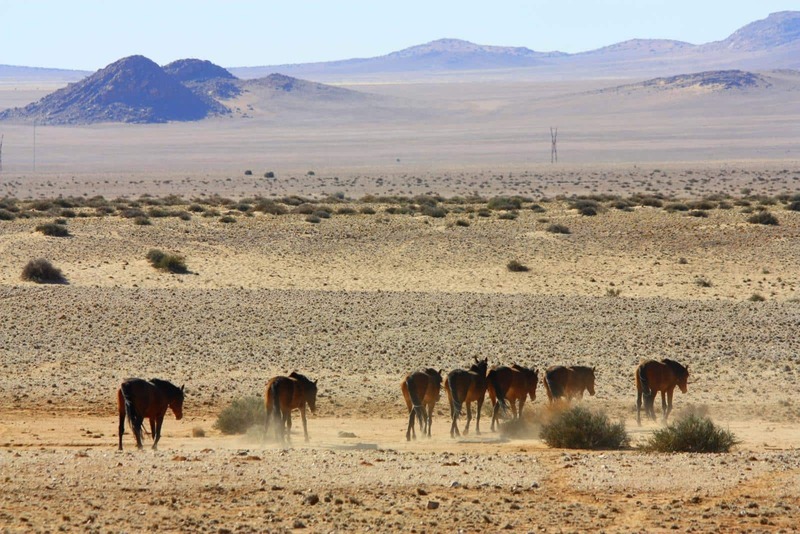 As you head west from Aus west on the B5 to Lüderitz, you will pass feral horses at the Garub Pan. The feral horses of Garub Pan. 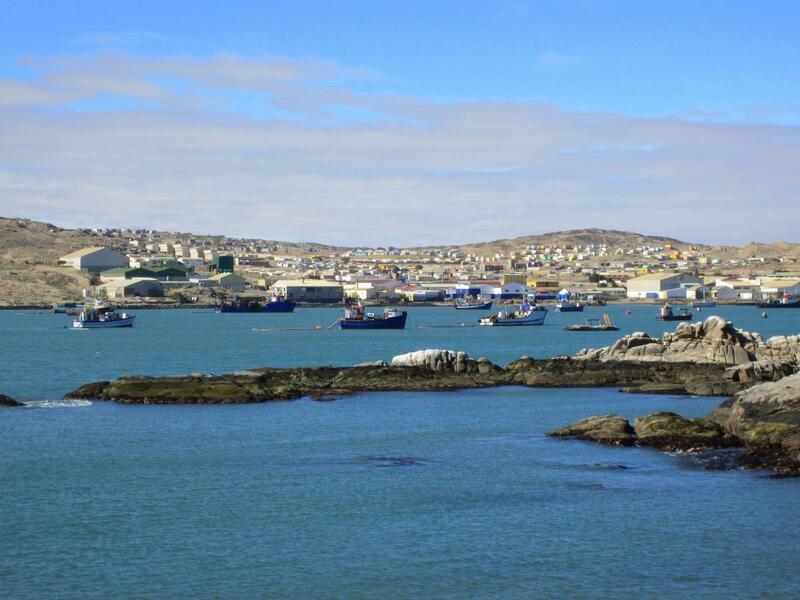 Lüderitz was founded in 1883 as a trading post, fishing village and guano-harvesting town. It enjoyed a temporary surge of prosperity when diamonds were discovered in the early 1900’s in the nearby Kolmanskop. Little has changed since the early 20th century and sites to visit in this historical German town include the Adolf Lüderitz Memorial, Felsenkirche (Church of the Rock), Haus Goerke Museum, Lüderitz Museum and Woermann Haus. Unfortunately Diaz Point and Diaz lighthouse are currently closed for tourists due to renovations. This charming harbour town is tourist friendly and offers excellent facilities and a variety of activities such as boat trips and desert tours. Boats in the Lüderitz harbour. 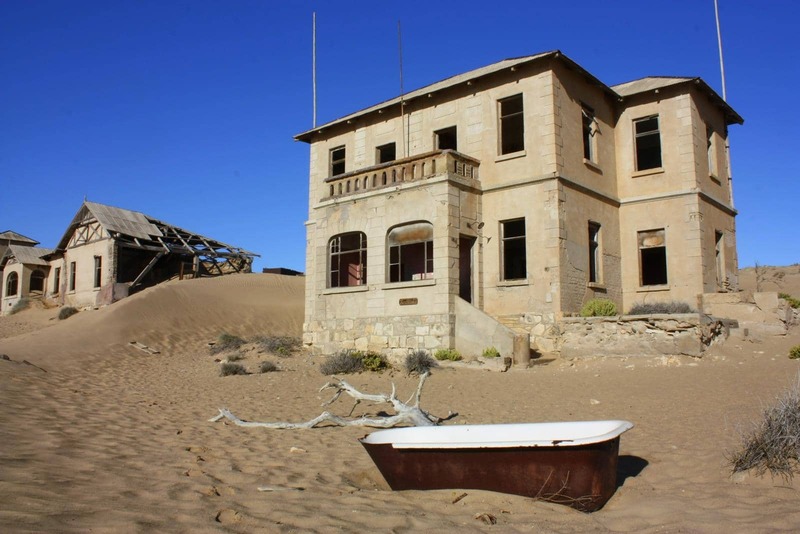 Kolmanskop ghost town just outside Lüderitz was founded in 1908 after the discovery of diamonds. In its high days the town boasted all basic amenities including a hospital, school and power station as well as entertainment for the miners living in the desert: a ballroom, skittle alley, theatre, sports hall, casino and even an ice factory! After World War I the town declined as the price of diamonds crashed and mining operations were moved to Oranjemund. The town was abandoned in 1956 but today this ghost town is a popular tourist attraction. Remnants of a luxurious lifestyle. 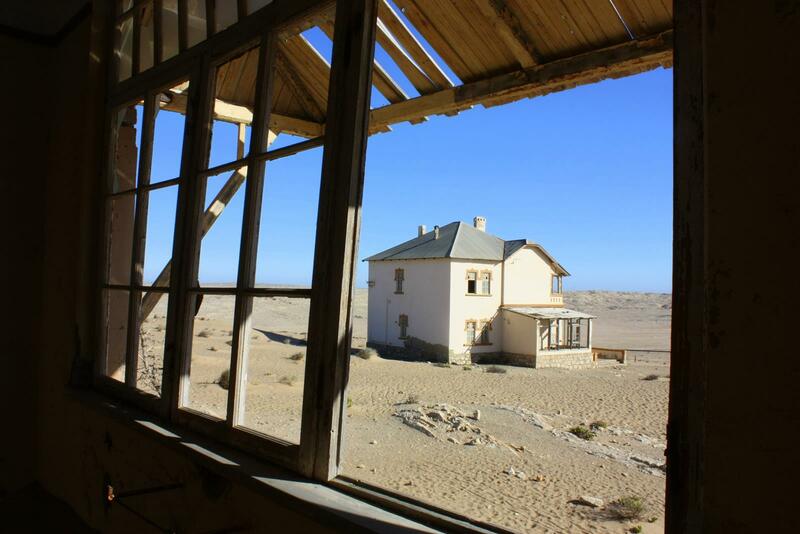 The ghost town of Kolmanskop. Heading back east from Lüderitz on the B4 and then north from Aus on the C13 you will pass through the Tirasberg Conservancy on your way to Bethanie. There are various camping and accommodation options in the area and you should plan to spend at least one night to enjoy the late afternoon splendour of the Tiras Mountains. Stop by at Bethanie and visit the two national monuments in this small town: the Rhenish Mission Church and the house of Josef Fredericks. 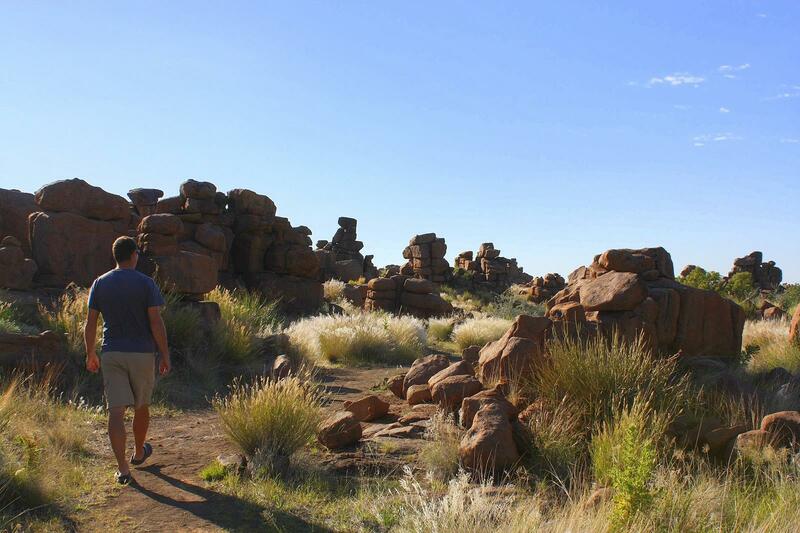 Just north-east of Keetmanshoop you can visit a Mesosaurus fossil site, dolerite park, do a different Quiver Tree 4WD Trail and explore the big dolerite boulders in Giant’s Playground, with the nearby Quiver Tree forest and Cheetah enclosure. There are various pleasant camping and lodging options on nearby farms. The boulders at Giant’s Playground. 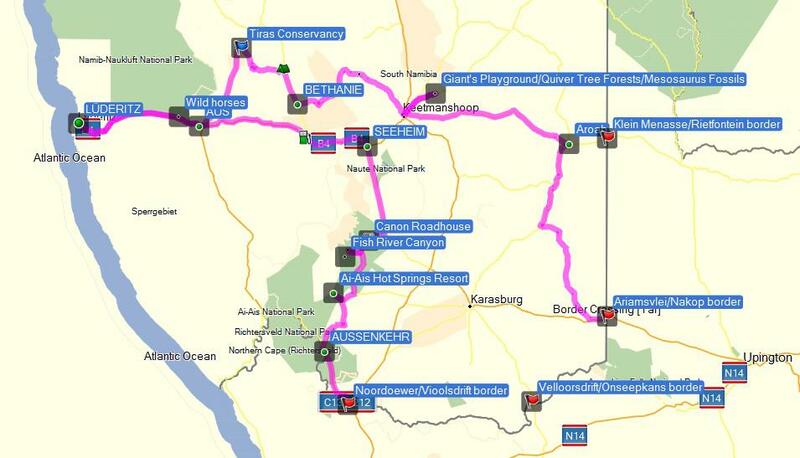 You can find all the above points on the Tracks4Africa GPS map of Namibia and more information and photos on our website. 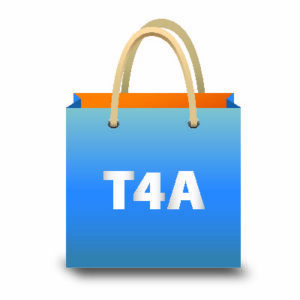 Don’t forget to take your trusted travel companions, the T4A paper map of Namibia and the T4A Namibia Guide Book when you visit Namibia.